Biography of French Impressionist Art Collector/Dealer. Early meetings of the group. The most famous member of a family of Parisian fine art dealers, Durand-Ruel was the first regular buyer of Impressionist paintings. He was already established as a dealer for the French Barbizon School of landscape painting, when he met Claude Monet (1840-1926), and Camille Pissarro (1830-1903) in England, during the Franco-Prussian War (1870-1), after which he quickly became a champion of the Impressionism movement, providing stipends and one-man shows for his stable of painters. However, critics of French painting as well as public opinion were less easily impressed, and his support of the movement drove him very close to bankruptcy. In fact it wasn't till his 1886 Impressionist show in New York that he finally made a breakthrough. The Durand-Ruel art dealership was the main conduit for collectors of modern art like the American drugs manufacturer Albert Barnes (1872-1951), as well as the Russian textile millionaires Sergei Shchukin (1854-1936) and Ivan Morozov (1871-1921). During the period 1890-1910, Durand-Ruel was the best known art dealer of French Impressionism in the world. He succeeded in establishing a market for it in America as well as Europe. In Paris, he was followed by such dealers/ collectors as Ambroise Vollard (1866-1939), Paul Guillaume (1891-1934) and Daniel-Henry Kahnweiler (1884-1979), who dealt mainly in Post-Impressionism. Founder of the Whitney Museum. Leading New York art dealer. available online as Poster Art. sculptors: Best Artists of All Time. He was born in Paris to shopkeepers Jean Durand and Marie Ruel, whose premises were also used to exhibit paintings and drawings by famous painters. In fact by 1840 the shop had become a regular rendezvous for artists and collectors, and so Jean Durand decided to turn it into an art gallery. Paul himself joined the business after the 1848 Revolution. He absorbed all he could from his father, and travelled around Europe to discover new artists and sell pictures. 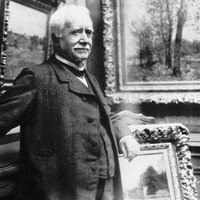 During the 1840s and 50s, the Durand-Ruel gallery specialized in particular in Barbizon School of landscape painting by artists like Camille Corot (1796-1875). In 1862 Paul Durand-Ruel married Eva Lafon with whom he later had five children. In 1863, his growing knowledge and status was confirmed when he acted as a "resident art expert" during a major art auction. In 1865 he assumed control of the family firm on the death of his father. In 1874 the Impressionist 'group' held their first joint exhibition. It opened for 4 weeks on 15 April 1874, in studios rented by the photographer Nadar at 35 Boulevard des Capucines. The exhibition, however, made such a loss that the artists were forced to disband the company they had only just formed. The following March, with the help of Durand-Ruel, they held a public auction at the Hotel Drouot, which proved even more disappointing, with the average price hardly exceeding 100 francs a painting. In 1876, Paul Durand-Ruel hosted a second exhibition of Impressionism in his own gallery. Both the show and his gallery were described as "insane". During the period 1876-1886, there were few improvements. Paul Durand-Ruel remained almost the only art professional to support the Impressionist group. Despite immense financial difficulties, he continued to buy their paintings and promote their art. As late as 1883, he organized Impressionist shows in Berlin, London, Boston and Rotterdam, without any noticeable overall success. Bankruptcy loomed. Then finally, his luck changed. In 1886, with Impressionism in America becoming more popular, the American Art Association invited him to organize an exhibition in New York. The show proved a major success and became the first official recognition of the Impressionist idiom. It also encouraged Durand-Ruel to open a new branch of the firm in New York, which became an important influence in adding Impressionist painters to a number of major American collections. In addition, the late 1880s witnessed a rise in popularity of Impressionism among French collectors, with Monet, Renoir and Pissarro becoming especially sought after. Thereafter, notably during the period 1890-1914, Paul Durand-Ruel held exhibitions of Impressionism in numerous locations around the world. His 1905 London show, for instance, which was held at the Grafton Galleries, featured over 300 paintings, including works by Monet, Renoir, Pissarro, Degas, Sisley, Cezanne, Eugene Boudin (1824-98), Frederic Bazille (1841-70), Gustave Caillebotte (1848-94), Whistler (1834-1903) and Mary Cassatt (1844-1926). In 1911, at the age of 80, he handed over control of the business to his sons Joseph (1862-1928) and Georges (1866-1933). In 1920, he was awarded the Legion d'Honneur for his contribution to "foreign trade". Two years later, he died. For other influential art dealers in Paris who appeared during Paul Durand-Ruel's last years, see: Leonce Rosenberg (1879-1947) and his younger brother Paul Rosenberg (1881-1959). The New York branch of the family firm closed down in 1950, while the original Parisian gallery continued until 1974, under the direction of Joseph's son Charles Durand-Ruel (1905-85). For 20 years, between 1871 to 1890, Paul Durand-Ruel spent hundreds of thousands of francs on pictures by the unknown and unpopular French Impressionists. Thereafter, between 1891 and 1922, he spent millions on 12,000 paintings, including roughly 1,000 Monets, 1,500 Renoirs, 800 Pissarros, 400 each by Degas and Sisley, some 200 Manets and almost 400 Mary Cassatts.  For more about fine arts buyers and their collections, see: Homepage.